Leading—it’s what Scouting has always been about. Striving to make a difference for the betterment of youth and the communities we call home. Focused on preparing Scouts to become better people and meaningful contributors to society—feeling better about themselves and the world around them. Some say its old fashioned values put to work. We’ve called it The Big Idea—a collaboration between businesses, community leaders and Scouting to make a significant impact to our community that will have a long-term positive effect. It begins with Scouts across the Cornhusker Council participating in community service, camping and activities this Spring. This year's Big Idea event will be held at Prairie Pines Nature Preserve on April 26th - April 28th. 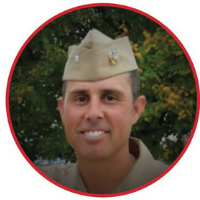 Commander Jack Riggins has 20 years of Naval Service leading Special Operations Forces throughout the world. He has been involved in numerous contingency operations and combat deployments in Asia, the Middle East, and South America. His last assignment was as the Combating Terrorism Lead for Special Operations Command Europe. Over the last six years Jack has consulted with numerous pro athletes, NCAA teams, and business leaders across the United States. Jack is a native of Fremont, NE who earned a NROTC scholarship and has a degree in Exercise Physiology from the University of Nebraska. Jack also has a MA in Global/ international affairs and Inter-agency collaboration from Kansas University.